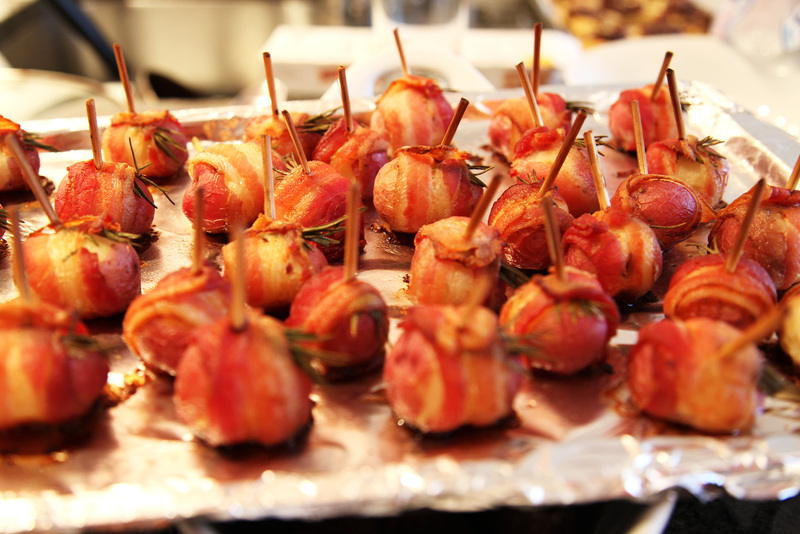 Got a party coming up and need some easy hors d'oeuvres? Try these little nuggets...use baby potatoes and wrap them in bacon! You can never go wrong with bacon, right? Even better, try adding different herbs or seasonings for unique flavors. Here I've used fresh rosemary sprigs but there's plenty of alternatives - sorrel, thyme, basil, cracked pepper. It's a superb comfort food in a tiny package! Also, try different types of potatoes. In this batch there's a mix of red bliss and yukon gold but I'd bet some purple fingerlings would also work great because of the nutty flavor. Bring a large pot of water to boil. Don't salt it - the bacon will provide enough. Boil the potatoes until just past parboil stage (not fully cooked). Meanwhile, line a baking sheet or deep dish with foil (remember that the bacon grease will drip so have a catch lip). Bring oven to 375°F. Remove and cool the potatoes in an ice bath. Carefully peel each potato, removing a strip about 1/2"-3/4" wide around it but not removing the entire peel. Cut the strips of bacon in half. Wrap one half-slice around the potato snugly and then poke a skewer into it to secure. Place the pan into the oven and bake for 20-22 minutes until bacon is crisping. Serve hot with garnish, enjoy the applause.